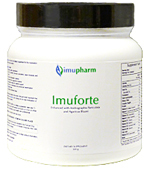 IMUFORTE contains specifically selected active plant sterols, nutraceuticals, vitamins, minerals and trace elements that have shown in a variety of research studies to have high antioxidant, immune-stimulating and multi-nutrient properties. The synergistic effect of their combination with the addition of a proprietary medicinal mushroom blend is designed to optimize the results. This unique formula has been used in patients with a compromised immune system to help enhance their immune mechanisms, promote liver function and normalize cell division. Medicinal mushrooms have been used in Traditional Chinese Medicine for about 2,000 years for various health conditions. Recent research has shown that a number of mushrooms have due to their polysaccharides (PSK), polysaccharopeptides (PSP), nucleosides, and triterpenoids immune-enhancing, anti-bacterial, anti-cancer, anti-inflammatory, and anti-viral properties. The Imuforte medicinal mushroom blend provides Ganoderma Lucidum (Reishi mushroom), Lentinus Edodes (Shiitake mushroom), Grifola Frondosa (Maitake mushroom), Cordyceps Sinensis, Coriolus Versicolor, Tremelia Fuciformis and Agaricus Blazei, which have shown special antitumor properties. The mushroom extracts are derived from the mycelial (budding stage) of the mushroom to ensure the highest level of biological and biochemical activity. SUGGESTED USE: As a dietary supplement, take one (1) level scoop mixed with desired cold liquid up to four (4) times daily or as directed by your health care professional. DISCLAIMER: The information contained on this web site has not been evaluated by the FDA. It is not intended to treat, diagnose, cure or prevent any disease. Material on the Imupharm web site is provided for educational purposes only. Always seek the advice of your physician or other qualified health care provider with any questions you have regarding a medical condition, and before undertaking any diet, exercise or other health program. In addition to their many vital functions, select vitamins, minerals and herbs have antioxidant properties. Antioxidants are substances that can protect cells from the damage caused by free radicals (molecules with a non-paired electron, which are natural by-products of metabolic functioning). Free radical damage may lead to cancer. Extensive laboratory findings from chemical, cell culture, and animal studies indicate that antioxidants stabilize free radicals and may prevent the development of cancer. Examples of antioxidants include vitamins A, C, E, Beta-Carotene, Lycopene, Coenzyme Q10 and other substances. Select vitamins, minerals and herbs provide not only antioxidant benefits but also modulate the immune functions on the humoral and cellular levels. Numerous research studies have indicated the immune modulatory effect of natural substances such as Andrographis Paniculata, Turmeric, Panex Ginseng, Lycopene, Grape Seed Extract, Germanium Sesquioxide, Bioflavenoid Complex, Green Tea Extract, Selenium, Co-enzyme Q10, Alpha and Beta Carotene, N-acetyl Cysteine, Glutathione, Selenium, and others, the more so, when they work in synergy. 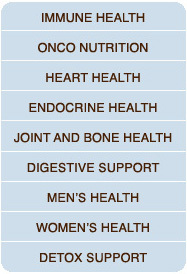 Herbal supplements are proven powerful antioxidants especially when assisting other nutrients. • Vitamin A is a fat-soluble vitamin also known as retinol. Most people are familiar with vitamin A’s role in preventing night blindness. • Vitamin A is a stimulator for the thymus and plays a large role in maintaining the function of the immune system. The Vitamins B are essential to the enzymatic processes in the liver. Along with the addition of Choline, N-acetyl Cysteine, Glutathione, Taurine, MSM and Sulphoraphane they enhance detoxifaction and elimination. • Vitamin C improves antimicrobial and natural killer cell activities. 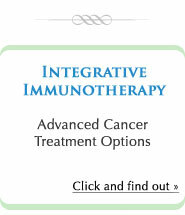 (Reference 17) It enhances overall immune functions. Vitamin E is a fat-soluble antioxidant that stops the production of reactive oxygen species ROS formed when fat undergoes oxidation. The body forms ROS endogenously when it converts food to energy, and antioxidants might protect cells from the damaging effects of ROS. Scientists are investigating whether, by limiting free-radical production and possibly through other mechanisms, vitamin E might help prevent or delay the chronic diseases associated with free radicals. (1) Wasser SP. Medicinal mushrooms as a source of antitumor and immunomodulating polysaccharides. Appl Microbiol Biotechnol. 2002 Nov;60(3):258-74. Epub 2002 Sep 10. (2) Liu YW, Gao JL, Guan J, Qian ZM, Feng K, Li SP. Evaluation of antiproliferative activities and action mechanisms of extracts from two species of Ganoderma on tumor cell lines. J Agric Food Chem. 2009 Apr 22;57(8):3087-93. (3) Jiang J, Grieb B, Thyagarajan A, Sliva D. Ganoderic acids suppress growth and invasive behavior of breast cancer cells by modulating AP-1 and NF-kappaB signaling. Int J Mol Med. 2008 May;21(5):577-84. (4) Mitamura T, Sakamoto S, Suzuki S, Yoshimura S, Maemura M, Kudo H. Effects of lentinan on colorectal carcinogenesis in mice with ulcerative colitis. Oncol Rep. 2000 May-Jun;7(3):599-601. (5) Ooi VE, Liu F. Immunomodulation and anti-cancer activity of polysaccharide-protein complexes. Curr Med Chem. 2000 Jul;7(7):715-29. (6) Ng ML, Yap AT. Inhibition of human colon carcinoma development by lentinan from shiitake mushrooms (Lentinus edodes). J Altern Complement Med. 2002 Oct;8(5):581-9. (7) Lin JT, Liu WH. o-Orsellinaldehyde from the submerged culture of the edible mushroom Grifola frondosa exhibits selective cytotoxic effect against Hep 3B cells through apoptosis. J Agric Food Chem. 2006 Oct 4;54(20):7564-9. (8) Cui FJ, Li Y, Xu YY, Liu ZQ, Huang DM, Zhang ZC, Tao WY. Induction of apoptosis in SGC-7901 cells by polysaccharide-peptide GFPS1b from the cultured mycelia of Grifola frondosa GF9801. Toxicol In Vitro. 2007 Apr;21(3):417-27. Epub 2006 Oct 13. (9) Jiménez-Medina E, Berruguilla E, Romero I, Algarra I, Collado A, Garrido F, Garcia-Lora A. The immunomodulator PSK induces in vitro cytotoxic activity in tumour cell lines via arrest of cell cycle and induction of apoptosis. BMC Cancer. 2008 Mar 24;8:78. (10) Gao Q, Seljelid R, Chen H, Jiang R. Characterisation of acidic heteroglycans from Tremella fuciformis Berk with cytokine stimulating activity. Carbohydr Res. 1996 Jul 19;288:135-42. (12) Cheung JK, Li J, Cheung AW, Zhu Y, Zheng KY, Bi CW, Duan R, Choi RC, Lau DT, Dong TT, Lau BW, Tsim KW. Cordysinocan, a polysaccharide isolated from cultured Cordyceps, activates immune responses in cultured T-lymphocytes and macrophages: signaling cascade and induction of cytokines. J Ethnopharmacol. 2009 Jul 6;124(1):61-8. Epub 2009 Apr 11. (14) Padilha MM, Avila AA, Sousa PJ, Cardoso LG, Perazzo FF, Carvalho JC. Anti-inflammatory activity of aqueous and alkaline extracts from mushrooms (Agaricus blazei Murill). J Med Food. 2009 Apr;12(2):359-64. (15) Journal of Experimental Therapeutics and Oncology. 2003 May;3:147. (16) Integrative Medicine. Vitamin A. 2000. Integrative Medicine Communications. (17) Wintergerst ES, Maggini S, Hornig DH. Immune-enhancing role of vitamin C and zinc and effect on clinical conditions. Ann Nutr Metab. 2006;50(2):85-94. (18) Chen Q, Espey MG, Krishna MC, Mitchell JB, Corpe CP, Buettner GR, Shacter E, Levine M. Pharmacologic ascorbic acid concentrations selectively kill cancer cells: action as a pro-drug to deliver hydrogen peroxide to tissues. Proc Natl Acad Sci U S A. 2005 Sep 20;102(38):13604-9. Epub 2005 Sep 12. (19) Van Straten M, Josling P. Preventing the common cold with a vitamin C supplement: a double-blind, placebo-controlled survey. Adv Ther. 2002;19(3):151-9. (20) Traber MG. Vitamin E. In: Shils ME, Shike M, Ross AC, Caballero B, Cousins R, eds. Modern Nutrition in Health and Disease. 10th ed. Baltimore, MD: Lippincott Williams & Wilkins, 2006;396-411. (21) Institute of Medicine. Food and Nutrition Board. Dietary Reference Intakes: Vitamin C, Vitamin E, Selenium, and Carotenoids. Washington, DC: National Academy Press, 2000. # U.S. Department of Agriculture, Agricultural Research Service. USDA National Nutrient Database for Standard Reference, Release 16-1, 2004. (22) Peters U, Foster CB, Chatterjee N, Schatzkin A, Reding D, Andriole GL, Crawford ED, Sturup S, Chanock SJ, Hayes RB. Serum selenium and risk of prostate cancer-a nested case-control study. Am J Clin Nutr. 2007 Jan;85(1):209-17. (23) Atkuri KR, Mantovani JJ, Herzenberg LA, Herzenberg LA. N-Acetylcysteine--a safe antidote for cysteine/glutathione deficiency. Curr Opin Pharmacol. 2007 Aug;7(4):355-9. Epub 2007 Jun 29. (24) Department of Biochemistry and Molecular Biophysics. The Biology Project. September 30, 2003. (25) Havre PA, O'Reilly S, McCormick JJ, Brash DE. Transformed and tumor-derived human cells exhibit preferential sensitivity to the thiol antioxidants, N-acetyl cysteine and penicillamine. Cancer Res. 2002 Mar 1;62(5):1443-9. (26) Mantovani G, Macciò A, Melis G, Mura L, Massa E, Mudu MC. Restoration of functional defects in peripheral blood mononuclear cells isolated from cancer patients by thiol antioxidants alpha-lipoic acid and N-acetyl cysteine. Int J Cancer. 2000 Jun 15;86(6):842-7. (27) Sadowska AM, Verbraecken J, Darquennes K, De Backer WA. Role of N-acetylcysteine in the management of COPD. Int J Chron Obstruct Pulmon Dis. 2006;1(4):425-34. (29) Balch, Phyllis, CNC, and James Balch, M.D. Prescription For Nutritional Healing. Avery Books, 2000. (30) McCarty, Mark. Health Benefits of Supplemental Nutrition. San Diego, CA Nutri Guard Research,1985. (31) Mindell, Earl, RPH, Ph.D. Prescription Alternatives. McGraw Hill, 2003. (32) Vucenik I, Shamsuddin AM. Cancer inhibition by inositol hexaphosphate (IP6) and inositol: from laboratory to clinic.J Nutr. 2003 Nov;133(11 Suppl 1):3778S-3784S. (33) Wien Klin Wochenschr. 2000 Jul. 98:112(14)10-6. (34) Proc Natl Acad Sci USAA. 1991 Jun. 1;88 (11):4656-60. Erratum in: Proc Natl Acad Sci USA 1991 Aug 1;88 (15): 6898. (35) Hamdi HK, Castellon R. Oleuropein, a non-toxic olive iridoid, is an anti-tumor agent and cytoskeleton disruptor. Biochem Biophys Res Commun. 2005 Sep 2;334(3):769-78. (36) Wells K. R. Encyclopedia of Alternative Medicine. (37) Fine AM. Oligomeric proanthocyanidin complexes: history, structure, and phytopharmaceutical applications. Altern Med Rev. 2000 Apr;5(2):144-51. (38) Agarwal S, Rao AV. Tomato lycopene and its role in human health and chronic diseases. CMAJ. 2000 Sep 19;163(6):739-44. (39) Aggarwal BB, Kumar A, Bharti AC. Anticancer potential of curcumin: preclinical and clinical studies. Anticancer Res. 2003 Jan-Feb;23(1A):363-98. (40) National Cancer Institute. 2007 Dec.
(41) Kaplan BJ, Parish WW, Andrus GM, Simpson JS, Field CJ. Germane facts about germanium sesquioxide: I. Chemistry and anticancer properties. J Altern Complement Med. 2004 Apr;10(2):337-44. (42) Mainwaring MG, Poor C, Zander DS, Harman E. Complete remission of pulmonary spindle cell carcinoma after treatment with oral germanium sesquioxide. Chest. 2000 Feb;117(2):591-3.